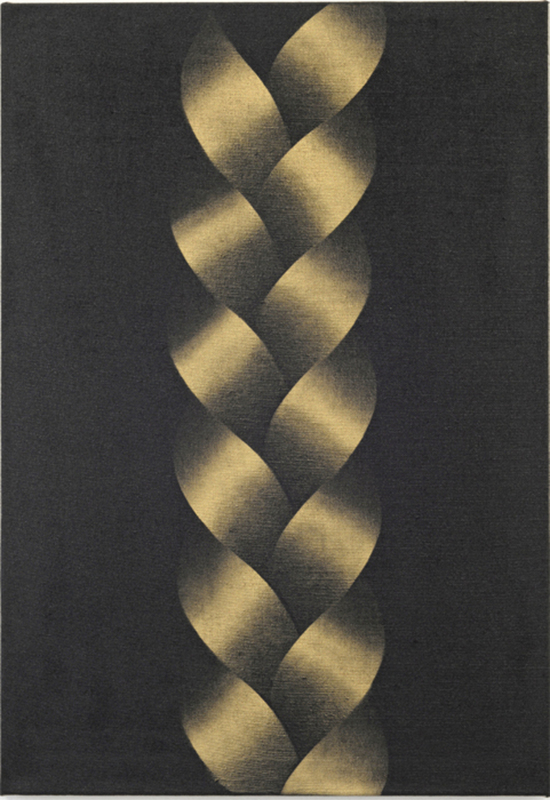 Michael Hakimi, Zopf (Plait), 2014, spray paint and lacquer on linen, 35 × 26 3/4". Michael Hakimi gave his recent show the title “Lichtfäden, die ins Bild hinüberwachsen” (Light-Threads That Wander Over into the Picture)a phrase, as he notes in an accompanying essay, borrowed from an early description of the photographic process, whose author is unknown. The indeterminacy seems fortuitous, allowing the phrase to float freely as a perhaps linguistic image, its myriad implicationsboth poetic and materialresonating with Hakimi’s work.